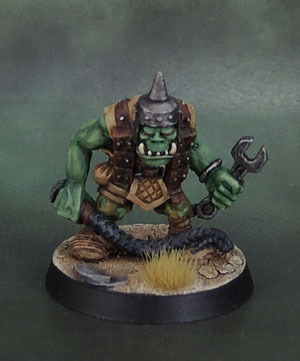 Orktober 2017 #2: Rogue Trader-era Kev Adams Space Ork Mekaniak (440206 – April 1989) | Azazel's Bitz Box. 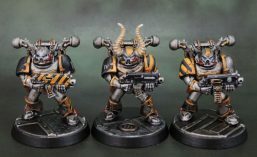 This entry was posted in 40k, 40k Orks, Oldhammer and tagged 40k, kev adams, Orks, Rogue Trader, Warhammer 40000, Warhammer 40k. Bookmark the permalink. Very nice work indeed on a great figure. He’s looking great, I like the natural colours and the cracked earth base. Together with his runts and gun he’s also part of my Blood Axe force, which every model with a spiked steel helmet was automatically enlisted for. 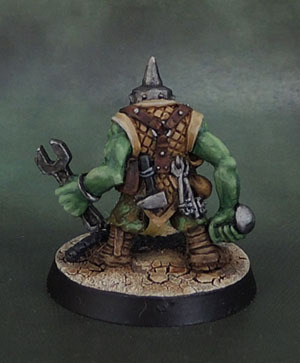 I’ll have to do some not-pickelhaubes myself when I get further into my Orks using the plastic helmets and spare chaos spikes. Thanks for the idea! He looks great! You’ve got me digging through all my old stuff. 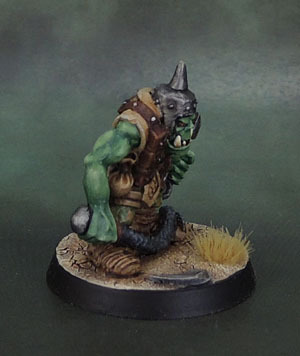 Funny how a model can look dated until you paint it. Thanks mate. I find that a lot of classic models really come up nicely with modern painting techniques. I’d love to see your stuff sometime! Looks great. Very neat paintjob. Thanks Alex. 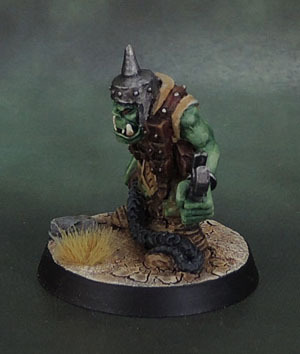 I’m really enjoying doing the “realistically” dressed Orks. Excellent work. The earthen tones of his clothing match well the cracked soil on the base. That strange Pickelhaube he is wearing is also quite interesting. Looking forward to see his Mek Gimps. Thanks D&B. The original series’ of models had a lot more freedom to them, so while there are some definite misses, you get some really interesting hits as well. Really well done, great to see this figure done. Color scheme works, and he looks fun! Thanks Mark. He was a lot of fun to paint once I got over the hump with him.